If there is one thing I love to do, it's challenge the status quo. And, if someone tells me that I can't do something I'm going to find a way around it so I can do it. That's one of the reasons why I joined the Marines instead of the Chair Force (no offense, fly boys). I was told (by several family members) that I couldn't hack it, so I flipped that proverbial bird and joined. It's also one of the reasons why the number of striker, polymer-framed pistols I own is very limited to a few, and why I carry a revolver several times per week. So, when someone told me that it was impractical to carry an 8-shot 357 Magnum N-Frame revolver, I laughed. I'm always up to the challenge so I asked Smith & Wesson to send me a 627 Performance Center model that is absolutely gorgeous. No joke, this thing is the epitome of a beautiful handgun. It wasn't all peaches ‘n cream, though. I actually had an issue with this revolver early on that blew my mind. Before I get there, though, let me tell you who I am and why I feel as though I'm qualified to write this gun review. My name is Josh, and I'm a gunaholic. More than that, I'm the editor of this fine publication and have been writing about guns for a handful of years. I got my start as a staff-reviewer for guns.com, was the editor at another place that I'll leave unnamed, and freelanced for several other places. But, before that, I was in the Marines and grew up around guns about half the time (while at my dad's house). I also had a brief stint with law enforcement as a corrections officer, during which time I had to qualify with a 38 special revolver and a 12 gauge shotgun. As it usually happens for us gun reviewers, I've had this gun for way too long. I've actually even moved with it to a totally different state in the Union. I'm not even sure how long I've had it, and I'm sure Smith wants it back. I've got 800 rounds of ammo through this beauty of all different kinds. Hollow points, flat nose, lead round nose, Hornady Lever Evolution, 38 specials, +P, etc. You name it, I shot it. Heck, I even had a few boxes of the G2 Telos in 357 and 38 sent out to me. Here it is in the 4 o'clock position, in a JM4 Tactical Roughneck holster. Believe it or not, it does conceal quite well for such a large revolver. This is an oddball gun when it comes to concealed carry, and I felt that when trying to find a holster for it. Remember, I wrote this article from the point of view of someone who is concealing this massive N-Frame revolver. And, believe it or not, I have concealed it on numerous different occasions and hid it well in a JM4 Tactical Quick Click and Carry Roughneck Holster. I'm really good friends with the owner, Chad, and talk to him a few times a week. Though, I'm not sure how happy he'll be that I wet-formed his holster to this massive revolver. This is also my bear gun in my newest home, where we have black bears as neighbors. Would I use this against a grizzly? Uh, no. Not really. On a smaller cousin, the black bear, sure. And, if I can't stop it from killing me in 8 shots, I guess I deserve whatever end I may meet. It should go without saying that using proper ammo in a bear gun, like 180 grain hard cast bullets that actually penetrate a bear is the best option. Your regular hollow points should only be used as a last option, if it's all you've got. As with all things, having a gun is better than a pointy stick. I did have a problem with this gun. I hate when this happens and I wish I could just give everyone/everything a glaring, positive review. Sadly, that's not usually the case. I only had the revolver out twice with about 70 rounds through it when suddenly I couldn't hit my target. I cleared the gun, placed it on the bench, and moved the target closer to me, about 3 yards away. Still barely hitting the paper, nowhere near the bullseye. I took a seat and used my range bag as a rest. I never shoot benched, but I was in diagnostic mode. Still nothing. It wasn't me, so I looked at the gun. What I saw was not only baffling, but highly disappointing since this is a S&W Performance Center revolver that I had fallen in love with. The front sight came loose and was just barely hanging on. I'm confident that if it had fallen completely out, I wouldn't have been able to find it. If I kept shooting that would have been the case. Thankfully, I stopped. I don't have a picture of the front sight coming out, but here is the front sight after the Locktyte. It was so loose prior that I could easily move it back and forth with minimal pressure. … I have sent your email over to Customer Service – someone should reach out to you. … Okay I never heard back from anyone, but I just stuck some locktyte on the front site and that seems to have taken care of the issue. I have not heard from anyone at S&W since, and I'm not sure why that is. Either way, the Locktyte worked. I had my gunsmith fix it because he is way smarter than I am with that sort of thing, and it has not gotten loose since. 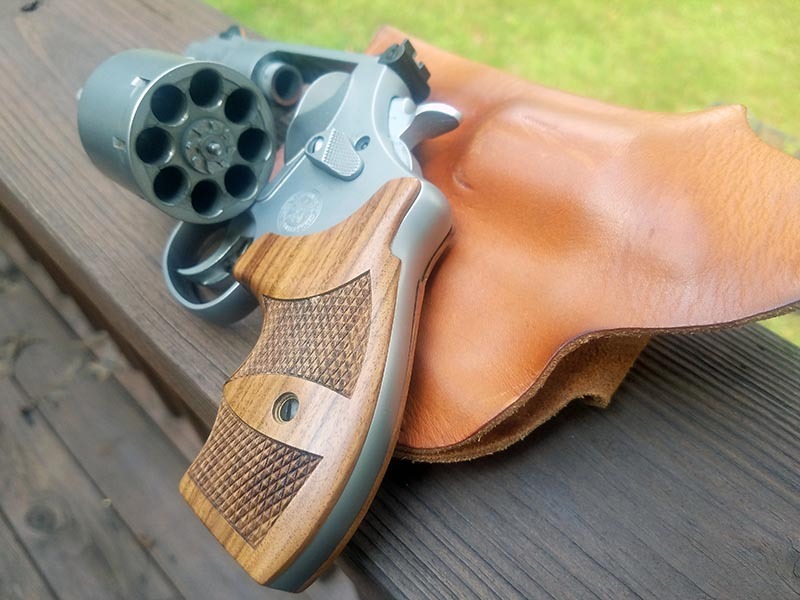 While the revolver is pretty, I do think a darker set of wood grips would look fantastic. Still, there are a few problems with this whole scenario. First, you'd think that S&W would have been all over trying to make a gun reviewer happy. After all, they have to know that I'm going to be documenting this experience, and I do so at the risk of them never sending me another firearm again. I've never heard of S&W doing that to a gun reviewer, but there are other companies who have. Second, what happened to customer service? Isn't it supposed to be stellar? Third, what happened to quality control? What would have happened if the front sight fell off when I needed it? Is this an issue? I'll leave this alone, but for a revolver with a $1,079.000 MSRP, you'd think they'd pay better attention to detail and at least take care of people. Other than the front sight, this revolver is gorgeous. Even with that issue I'd buy this gun. In a heartbeat. Street price, by the way, is under $900 in most places. While none of us want the front sight to fall off and we do want customer service to take care of us, it was easy enough to fix by myself and the gun has given me no other issues with hundreds of rounds downrange, to date. In double action, the trigger is about 11 pounds, but feels smooth and easy to pull with an unmistakable break. As does in most DA revolvers, the trigger resets all the way out. There is no mistaking break or reset. In single action, minimal pressure is needed to send the tear-shaped hammer home, pushing a round down the barrel. This shot was taken at the range this past winter. Yes, I've had the gun this long. Notice the clips there to help aid in loading the cylinder. The large revolver fits well in my huge mitts, and while I found myself missing a spot to put my pinky on, the tip of my pinky finger does come back to rest on the backside of the gun's grip. 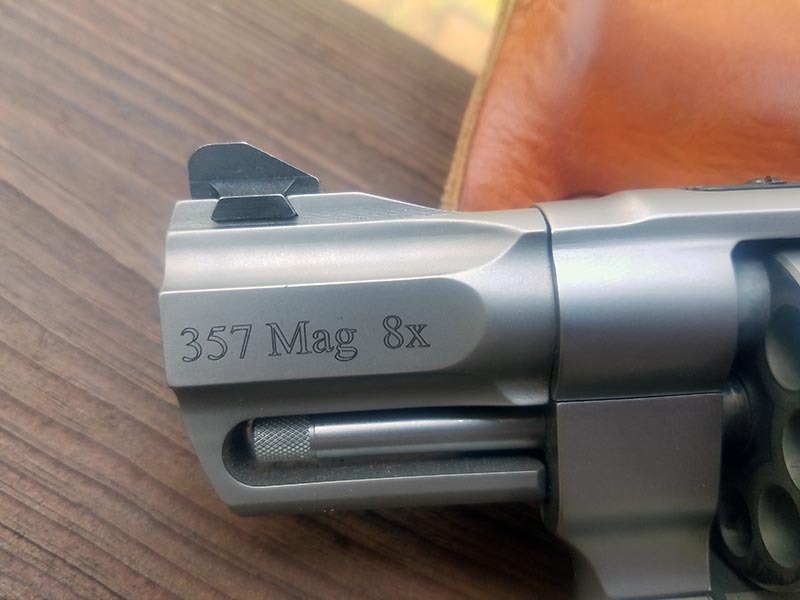 That full, textured grip, along with the 37.8 ounce weight really helps to mitigate felt recoil out of those hotter 357 magnum rounds. For me, recoil out of the 38 specials I used was negligible. I found that the gun was very concealable, even with its overall width at the largest point being 1.75 inches. The 2.625 inch barrel length definitely helped aid in the ease of concealment. I mentioned a few minutes ago that this has been my black bear gun for when we go on hikes as of late, since we just moved to the Blue Ridge Mountains in NC. While it's my first goal to avoid bear at all costs, I do feel confident that with the right ammo in this revolver, I'd be able to protect my children should that dreaded time ever come. 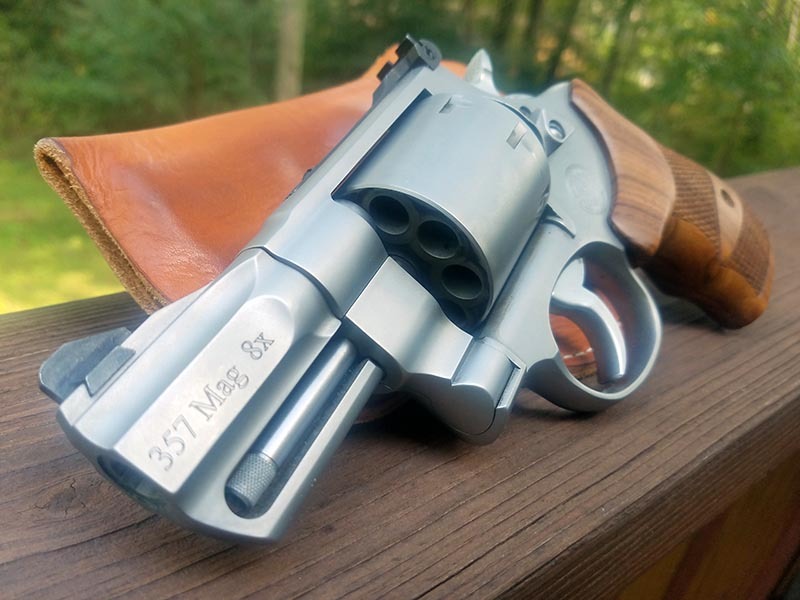 Perhaps one of my favorite aspects of this S&W 627 PC 8-shot revolver is that the ejector rod didn't hangup once on the release of empty casings or inserting fresh rounds into the cylinder. It may sound strange to have the ejector rod be one of my favorite things on this beauty, but I've had revolvers in the past that hang up just a bit in either direction which can make it difficult under stressful reloads. This PC rod being so smooth aids in unloading and reloading under stress. The ejector rod is of one piece construction with a tight-feeling spring to help return it into home position after the spent casings have been ejected. As a side note, the ejector rod is usually one of the first things to go in a revolver, and where a huge portion of revolver malfunctions come into play. The overall looks of the gun are what wowed me when I first opened up the case it came in. 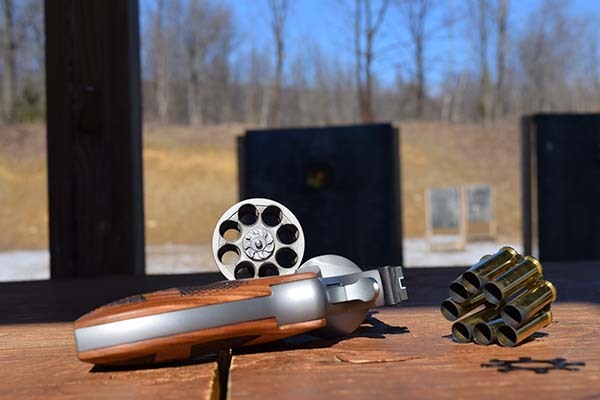 I love the un-fluted cylinder of these modern-day wheel guns, and the matte stainless finish pops just enough to bring the right amount of attention while at the range. That, coupled with the simple fact that most folks didn't even know that an 8-shot magnum revolver was a thing, is a conversation starter each time I went. 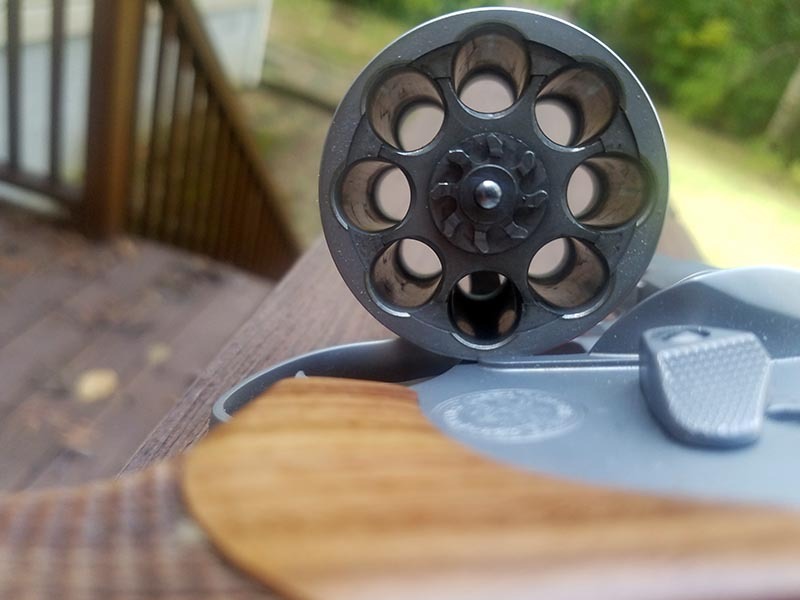 I was fighting glare here on my back deck, but the beauty of this gun cannot be mistaken. The ball was sadly dropped here, but I honestly don't think this is normal for them. Either way, the gun is gorgeous and accurate when functioning properly. As I mentioned a little while ago I would buy this gun if given the opportunity to do so at a good price. While many gun publications are accused of being paid shills by the gun companies, it's my promise to you that I'll always push for honest reviews for as long as I'm around. Gun reviewers are ambassadors to gun buyers. It's our first job to make sure you get accurate information and we will never lie in a review. Period. I love my Performace Center 7-shot 686+! Just an L frame, so not quite as large, but so easy to carry and conceal. I may be Air Force and I have a different version of this weapon with a longer barrel but I would never denigrate a Marine. While I was serving I was happy to be on the same side of all our military men and women. I was also serving to preserve the freedom of good people who were downtrodden by our and their enemies just as others who were serving. It’s all in good fun, my friend. We all pick on each other a bit, just like I’ve been told by Air Force guys that Marines eat crayons because Marines are dumb as a rock. It’s all in fun. At the end of the day, we all cover for each other. If you provided air support for my regiment and then got shot down, we’d go get you in a true one hand washes the other scenario. Well we all serve and all bleed the same red white and blue… My father was Army, I was Navy, my Brother is career Airforce and my Oldest Son is ANG and a Christian county EMT …. Main point we all put our lives on the line for the protection of American Freedom, especially the right to bear arms in case of the unfortunate circumstance of abject tyranny…. Thank you Josh for you insight and candor as we all seek to find the best tools to defend our rights, our families and our local communities…. Good review, except for some grammatical errors. Please edu-ma-cate me, oh enlightened one! What size was the IWB holster you got from JM4? I was looking for just the thing for my 627 PC just in the darker brown double lined version. Was there any issues with fitting or draw for the larger N-Frame? It was a Roughneck. I’ll have to get back to you on the size. I’ll send him an email and ask. 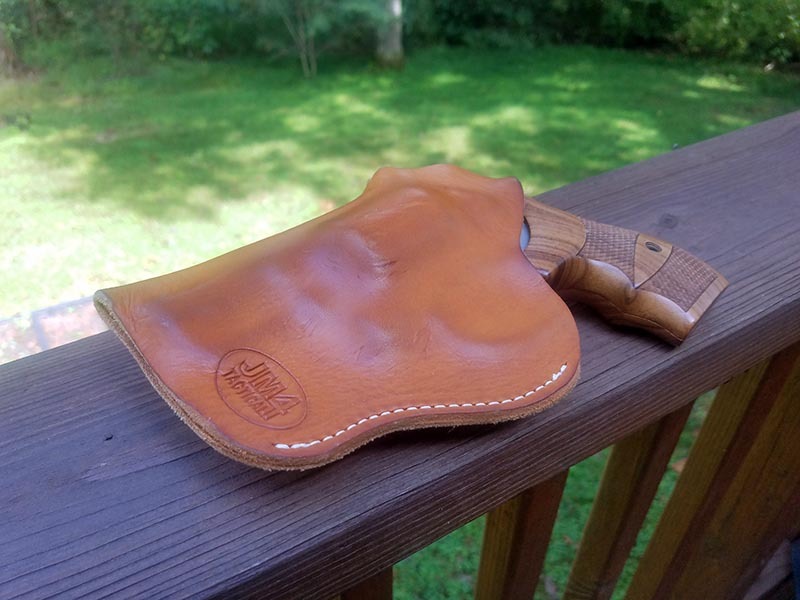 Have you found a pancake style holster that fits? 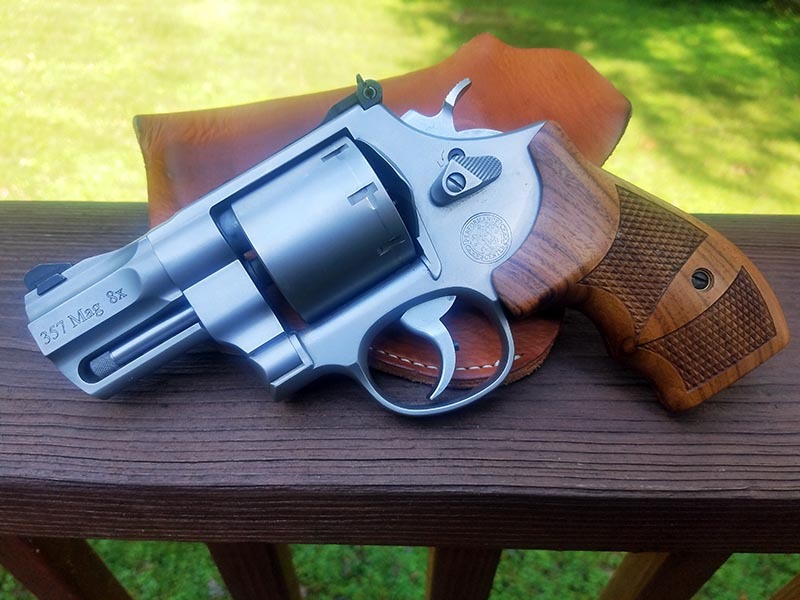 I just purchased this revolver for the same reason; hiking where bear and mountain lion habitate. 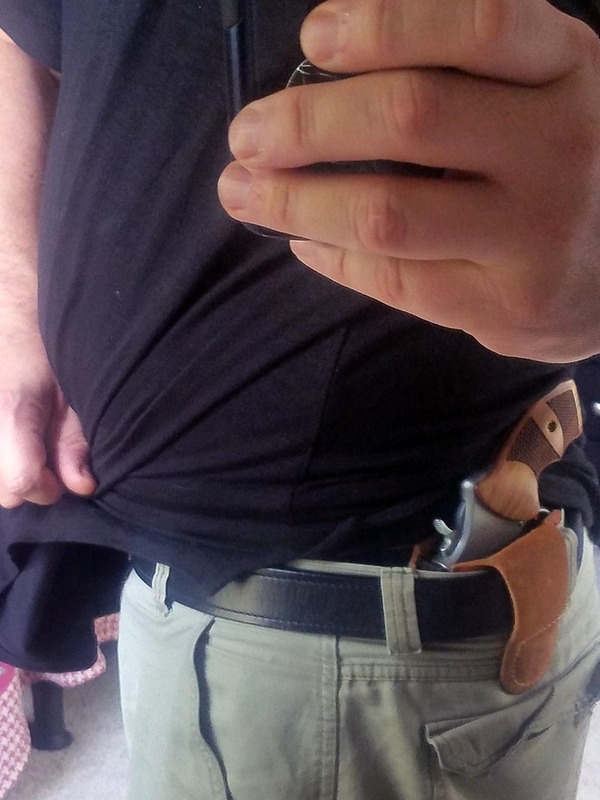 I don’t need to conceal it so much so an outside holster would be preferred. I have not found one, no. I do believe they are out there, though for custom ordering. I’ll keep my ears open for you. 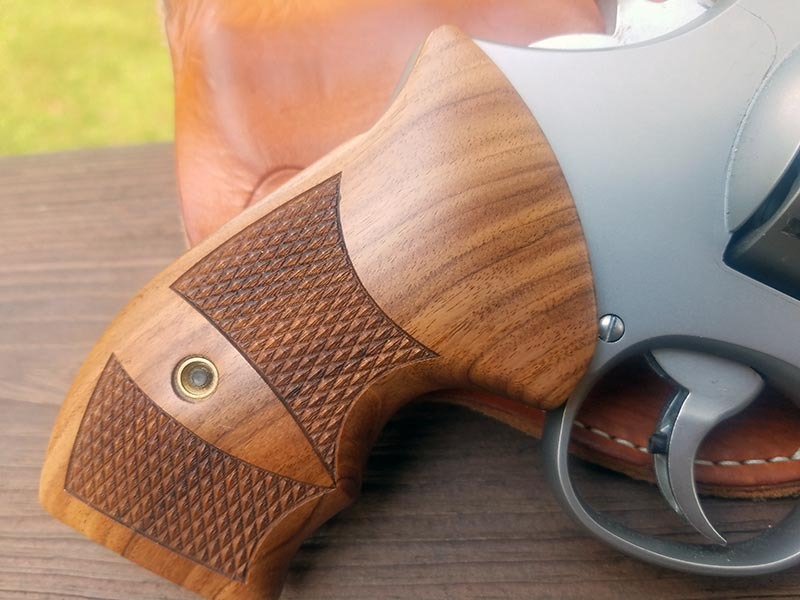 What size did you purchase I have a spee bee conceal carry but it kind of hard to conceal what size did you order and when you wet fit it did you get the leather wet and place the gun into the holster and when dried it formed to fit the gun? I also had a problem with my 627 and I also emailed the general customer service address. They sent an automated response and then, nothing for a week or two. Apparently, and according to the CS rep I spoke to when I finally decided to quit waiting and phone them, he said the people handling my initial inquiry had gotten my email address wrong. I’m not sure how that could be done once a thread is established but…oh well. My problem was more serious and could have resulted in disabling, or even damaging the revolver if I had not caught it and sent it in for service. Since it is still in limbo, I cannot report the outcome yet. 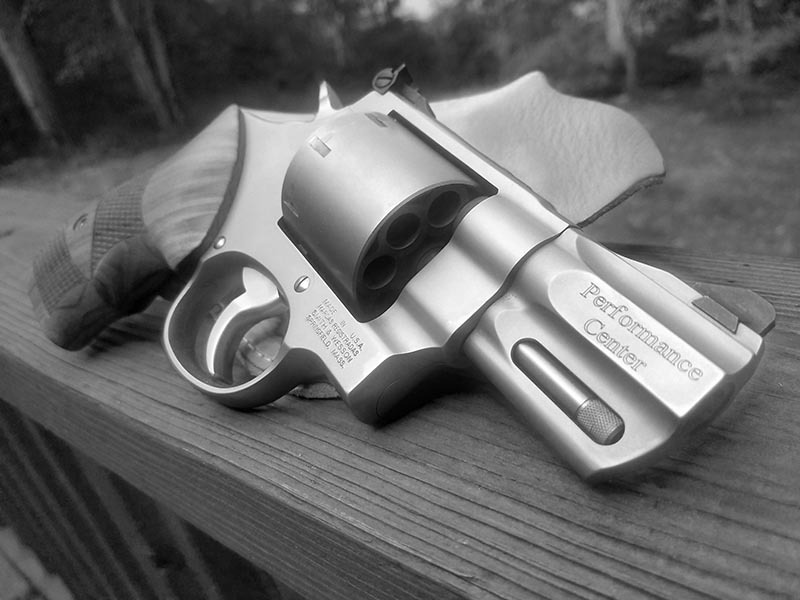 I do think however that for a revolver carrying a $900 to $1000 price tag…and bearing the title of “Performance Center”…which is supposed to receive special attention to detail during manufacture and assembly…that problems like the author and myself encountered…should not happen and should be more proactively dealt with by S&W. As I said, I am still waiting on my repairs, but so far I feel like this company is a bit lacking in customer RELATIONS.